--from Alma Guillermoprieto's comment piece in the current New Yorker. To review past best/favorite leads of the month, go here. --Jean Cocteau, whom the novelist Edith Wharton once described as a man "to whom every great line of poetry was a sunrise, every sunset the foundation of the Heavenly City." To learn more about the late French poet, novelist, painter and film director, go here and here. Pantsuits for Everyone. Last week, I noted the curious fact Leno and Letterman both happened to seize on Hillary's pantsuits on the same night in their opening monologue. A few days later, New York Times columnist Maureen Dowd also used the word in writing about Hillary in this column. Have you spotted any other mentions of Hillary's pantsuits? Please send them along if and when you do. More Interesting Timing. Fast on the heels of the welcome news that Josh Marshall's Talkingpointsmemo site has just landed the Polk Award for investigative journalism, for breaking the story of how the White House corrupted the Justice Department (by piecing together isolated reports from around the country and finding a pattern), we note this CBS 60 Minutes report that explores more corrupt dealings by Karl Rove. 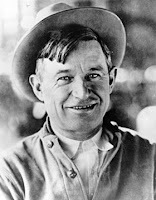 He was also the main mastermind of the sackings of the U.S. Attorneys for failing to do Republican bidding. Anyway, congratulations to Josh Marshall and his team, which I've written about often before in this space. ESPN.com Helps Launch Hoops Legend's Audio Book. Check out Kareem Abdul Jabbar's new interactive story project here. Finally, last year I noted the 40th anniversary of the iconic photo of Israeli paratroopers pausing in wonder in front of the Western Wall, shortly after their victory in 1967's so-called Six Day war. The other day I noticed this interesting article, which recounts the story behind that photo, taken by a photographer for Time-Life. --psychologist Carl Jung. For an earlier Jungian quote, go here. The Swiss-born Jung--whose influence on the field of modern psychology and psychiatry ranks only behind that of Freud--lives on through the C.G. Jung Institute in L.A. and through his many books. --from American Prospect co-founder Robert Kuttner's essay in the February 7th issue of the New England Journal of Medicine. Our favorite hoops team, the Cleveland Cavaliers, just made a huge three-way trade this week, and we found this online conversation among Cavs fans at Cleveland.com interesting. We also got a special kick out of one wag's comment that this site, a hub for those with complaints about one of the traded players' poor shooting skills, would now receive fewer visits. 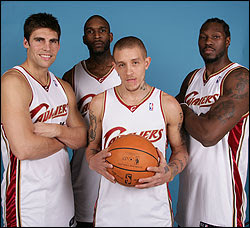 The four new players are pictured above. The photo is by David Liam Kyle, a prominent Cleveland-based sports photog who used to take photos for me at the John Carroll magazine, and who at 6'-10, also played some college hoops himself, at Cleveland State. My favorite Dave Kyle memory: once, while walking back from a photo shoot he did with a football player who was the largest guy ever to play at JCU (about the same height as Dave), I listened in as the two giants traded suggestions on their favorite places to shop for big & tall clothing. --Harold Clurman. A towering figure in the American theatre, though rather less than a household name, the self-taught Clurman was chronicled in PBS's excellent American Masters series. --George Orwell, from his 1947 essay Why I Write. I encourage you to click on it to read and savor the entire piece. To review earlier mentions of this uniquely courageous voice, and to follow links to his equally compelling, and far more famous, essay Politics and the English Language, go here and here. --from a profile of movie producer Jerry Weintraub in the current issue of Vanity Fair, the annual Hollywood issue. The author also obtained a memorable quote about his subject from actor George Clooney: "He's a hurricane. the barometer changes when he enters the region." This time it's a three-way tie. These books all carry titles so provocative that they guarantee I'd at least stop a moment at the bookstore and take a quick flip-through. Here they are: Are You There God? It's Me, Kevin--A Memoir (the title is apparently a play on a popular Judy Blume book for children). Also Who's Been Sleeping In Your Head--The Secret World of Sexual Fantasies. And finally, What Men Don't Tell Women About Business--Opening Up the Heavily Guarded Alpha Male Playbook. To review earlier Favorite Book Titles, go here. I've written before about how different in sensibility Jay Leno and David Letterman are. But they can also occasionally be like Time & Newsweek, the two leading brands battling so intently for bragging rights to the zeitgeist that (it's the magazines I'm talking about now) they have been known to sometimes go weeks in a row with the same cover subject, occasionally including eerily similar photos (though that's far less true now than in the past). Last Wednesday evening was a case in point. On the same night, and within seconds of each other, both comedians joked about Hillary Clinton in their opening monologues by referring to her pantsuit. Leno: "She got the pantsuit beat out of her" in recent primaries. Letterman: "Hillary appeared with a pantsuit painted on." Now that's just plain weird (but also funny). Anyway, we happen to be Letterman fans around here. To review earlier mentions of him and his show, go here. If I lost you in using the word zeitgeist (an essential German word that has no real equivalent in English) you'll find a definition here. I've fallen way behind on posting a bunch of interesting things I've set aside to share with you, so I'm just going to begin to catch up on those today. I'll add many more in coming days. Joel Continues His Thought Leadership. My friend Joel Cheesman, a true web dynamo, was quoted in the Wall Street Journal this week. But that's barely cause to notice anymore, given his ever-expanding influence. The one-man vertical-industry news bureau continues to show what a single smart, well-connected and well-informed person can do by intelligently leveraging the web. His blog has become a must-read in the recruitment industry, and at his still relatively tender age (he's a new parent), he's barely begun to scratch the surface of what lies ahead for him. Petkovic's Permanent Bad Hair Day. Can anyone please explain to me why an adult human being would pose for a photo to be used in conjunction with their profession, while looking like this? Okay, so rock critics are different animals than the editors of the business page. I suppose they want to blend in with people they write about. But this is ridiculous. Please, can somebody get this guy a comb next time he takes a photo? On second thought, you'd better make that a brush. Expect Male Productivity To Plummet For Awhile. The annual Sports Illustrated swimsuit issue, which provides a chance each year for purists to complain about the decline and fall of our culture, has a welcome new twist this year: it's all available for free online. If you're into that kind of thing, do enjoy it. The Power Couple. Ohio Senator Sherrod Brown talks to The Nation, and draws a map for his fellow Dems on how to win in Ohio, which may or may not be as much of a key this year to winning the White House as it was in the recent past. Meanwhile, his wife, Plain Dealer columnist Connie Schultz, is set to speak to the Union Club next month about the journeys women take. An appearance in this venue has some especially pleasing ironies for a woman who has been such a strong proponent for women generally. It was only a quarter century ago, after all, that this oldest of the old line Cleveland clubs, the very embodiment of the starchy corporate male power structure in Cleveland, finally broke the gender line by permitting women (I believe it was 1983, rather late in the game for these things). And even then it took someone of such imposing credentials--the then-head of the Cleveland Federal Reserve Bank, Karen Horn--that it makes one wonder if the club might still be all-male if not for her. One last funny irony here. While the club did eventually admit women for full membership, since 1882 (according to the Encyclopedia of Cleveland History, which needs some updating on this entry) they had qualified access, including (if you can believe this) separate dining rooms for the sexes. An elderly club veteran once told me a story about Tom Vail, the longtime publisher of the PD, whose family sold the paper to the Newhouses way back in the '60s, but who continued to be publisher through the early '90s. For years, Vail chose to take his lunch in the women's dining room, sitting alone. Whether that was to avoid carping about the paper's coverage from his fellow male executives or not, I've never been able to ascertain. But I do plan on trying to ask him about this one day. With my friend Diana Tittle's considerable literary assistance, he did publish a slim book not long ago, a memoir about his dealings with nine U.S. presidents. Alas, I can find not one trace of the book or of him on the entire Internet. I suppose that's the final irony in this tale. Superstar Women are More Portable. Finally, should our friend Connie ever decide to pick up stakes and leave the PD for better pastures (which I don't expect), she can take heart in this fascinating write-up in the current issue of the Harvard Business Review. Based on considerable research, it reveals a significant gender difference between male and female top performers when it comes to changing jobs. Women, it turns out, have more portable networks, and thus are far more successful in continuing to shine at a new company. Men, meanwhile, on average tend to depend more on their internal network, and thus are more crippled when they switch jobs. Now, that's interesting. --from a recent item in marketing guru Seth Godin's wise and wonderfully reflective blog. To review earlier mentions of Seth, go here. --the late poet and activist Muriel Rukeyser. To learn more about her poetry, go here. To check out her FBI file, released through the Freedom of Information Act, go here. ...You have an opinion on the serial comma. ...All your bedspreads have ink stains on them. ...You liked the book better than the movie. ...You refuse to get rid of any book you've read, even the ones you hated, such as The Bridges of Madison County. ...You use em-dashes and semicolons in your text messages. ...You have a file on each member of your family. ...If they paid you not to write, you would write anyway. --from the book You Know You're a Writer When, by Adair Lara, former San Francisco Chronicle columnist and founder of Matchwriters.com. Here's the table of contents (at least at the moment) for that book I mentioned last week that's currently in production, Writing as Muscle Memory: 35 Things You Can Begin Doing Today To Tone Your Writing Muscles And Hone Your Craft. A special thanks to Art, Tina and Maria for the beginnings of a very lively and interesting discussion about the intro. Even more grist for my mill, folks. --from a powerful & poetic essay published last week on the Wall Street Journal editorial page, by a New York writer I'd never heard of before. But now I'll be watching for that name. The piece goes on to observe that "midlife is a last chance to keep your word with the 10-year-old you once were, who looked forward at life and made a pact with the future." If you're in your late 30s or above, do yourself a favor and read it closely. I predict it will provide you with much upon which to reflect. As you scan the newstand and catch the latest pandering cover package about ever-softer subjects, you may occasionally wonder, like me, if there's any future for newsweeklies. Between the faux-trend pieces and ever-shorter articles, they don't often feel very vital to the serious reader's diet. But there are exceptions. This splendid piece in Newsweek, about what it calls "the backlash against the happiness rat race," delivers an awful lot of insight about what it calls "the medicalizing of sadness." For some, the author writes, "rather than listening to Prozac, they want to listen to their hearts, not have them chemically silenced." Anyway, I highly recommend this article. It now joins our continuing series on the topic of happiness. To review earlier explorations of that subject, including a great comment string, you can go here and here. Who Are We to Argue with the Mahatma? --Gandhi. For earlier snippets of the great one's observations, go here and here. I don't have much time to write here today, amid various project deadlines stacking up like planes waiting to depart Chicago's O'Hare Airport. But here are a few quick things I thought worth mentioning. Our Favorite New Company Name (at least it's new to us): Media Schmedia. And as a bonus, it's local. Trust us: We're Known Prevaricators (That's a Nice Word for Liars). Giant PR firm Edelman, which has been caught doing some egregious things, like trying to pass off a phony blog for similarly ethics-challenged client Wal-Mart, offers up a trust survey. Sorry, folks, but when you lack credibility yourselves, it's a bad idea to be commissioning polls on trust. It only calls that much more attention to your shoddy reputation. Good for you, Bob Reich. It's not easy taking on an old friend and former American president, publicly pointing out that he's been uttering untruths (there's yet another synonym for lying). But someone's gotta do it. The former Labor Secretary and former FOB (Friend of Bill), dating back to their days at Cambridge as Rhodes Scholars, calls Clinton to task for his shameful attacks on Obama. In my eyes, Reich (who stands just under five feet tall) can walk tall and proud for speaking up this way. And this isn't the first time he's been a truth squad on the subject of Clinton. A decade ago, he wrote an entire book about his time in the Clinton Cabinet, which documented how his old friend tried his best to marginalize him for his liberal views. What is Councilman Zone Smoking? The West Side Sun covers a story about the rehab of an old theatre on Cleveland's near west side, Gordon Square. So far, so good. Then it quotes the neighborhood's councilman, Matt Zone, saying something so ridiculous that I read it three times, just to make sure I hadn't misundstood him. "I believe that, upon completion, Gordon Square will be synonymous with other destinations like Soho, Dupont Circle and Greenwich Village. Ten years down the road it will have that kind of recognition." If you've ever been to that blighted Cleveland neighborhood and the lively, booming NY and DC neighborhoods of which he speaks, you wouldn't merely think that's a ridiculous statement. You might actually think only a fool could say something so silly. Yes, I'm all in favor of a councilman singing the praises of his own area and trying to raise everyone's hopes. But come on--use some common sense. Cleveland will never be like NY or DC--it doesn't have the population density or the economic base to begin to pull it off. So just get used to it, folks, and do the best you can. Offering up laughable benchmarks doesn't help your case. It only makes you look ridiculous. Nearly 20 years ago, when I was no more than a modestly promising fledgling writer myself, I somehow got the notion that I should begin teaching the craft to others. It wasn’t so much an exercise of writerly ego—though there was no doubt some of that involved—as it was a sense of desperation to quicken my own learning curve. I had attended a writing class in which the instructor airily prattled on for hours without providing much in the way of real substance, and I came away deeply unimpressed, even cheated out of the modest fee. “I could do better than that myself,” I thought. Before long, I arranged to do just that, or at least to try. Something told me that by preparing the material to share with others, I would begin to better grasp the whole writing process myself. They say nothing prepares you for a subject like having to teach it to others. Still, I was like the proverbial rookie teacher, reading one chapter ahead of the class, painfully aware of my own limitations. During my lunch hours at work, I began making notes to myself about the mechanics of writing, photocopying examples of what I considered great work, taking special care to point to the most vivid writing I could find in various genres. To emphasize great descriptive writing, I pored through the dictionary—yes, a common desk dictionary—and highlighted words that I thought were especially well-defined. I loaded all the material into a backpack, climbed aboard my bicycle, and pedaled off to meet the class of adult lifelong learners at a local middle school. A half dozen middle aged people—all older than I--were there waiting for me when I arrived. As I entered, I felt them eyeing me hungrily, as I had earlier eyed my own instructor, hunting for clues on whether this young guy could possibly help them learn what they came here to absorb. I decided—again through little more than intuition--that the best way to begin would be to briefly go around the room and get everyone’s story—who were they, why were they there, and what did they hope to learn from this class? I figured the benefits would be two-fold: it would help me more closely tailor the material for each them, and it might also break the ice and get everyone more comfortable with each other. If we all undressed a little together, I figured, maybe we could all lighten up and relax. Maybe we could drop the inevitable, unspoken but nevertheless palpable comparisons about our various skill levels and just help each other learn. I’m not sure I’ve ever been more stunned by someone’s words, before or since. I spent the next hour in a mental fog, trying to process what she’d just said—as well as its implications on my responsibilities as a teacher--while at least pretending to give my full attention to the class. But what I really wanted was to excuse myself and head home, or at least hide out in the bathroom. Anything but try to answer that woman’s naked cry of pain. I didn’t have the slightest idea of how I might help her. Wasn’t this just a writing class, after all? What was I, a shrink? No, I was just a skinny, 28-year-old writer of painfully modest accomplishment, a newlywed without children yet, and certainly without enough life experience to be able to begin to understand her pain. Sadly, it seemed she had come to the wrong place for answers. And yet, in the years since, with added perspective, I’ve come to understand that she did me an enormous favor. She taught me a lifelong lesson I can never forget: that writing, reading and language is serious stuff. It really matters to millions of people, even if they will never be writers, never be published, even if they never intend to try to get published. Sometimes, people just need to use written language to figure out what they think, to make sense of their otherwise scattered experiences, to find a cohesive narrative to their life. The percussive shock of Jeanne’s earnest request woke me up to the real stakes of my life’s work that day. No one would ever have to impress that upon me again. Over the years, I’ve coached, taught, mentored or encouraged several hundred writers. Many were of course beginners. But more than a few were also far more accomplished stylists than I’ll ever be—though most simply didn’t know or believe that. My task, I always thought, was to find that elusive switch in their brains, the switch that, when turned on, makes a person believe they’re a writer. Which is when they really begin to write. I’ve had a few proud, glorious moments as a writing coach and teacher who remains a writer first. Students have gone on to do some remarkable things–one recently published his fifth novel, and he’s been steadily building international acclaim as a talented weaver of tightly crafted thrillers. In Great Britain, his books even outsell the runaway hit The Davinci Code. But I’m every bit as proud of and interested in the progress of Alicia, who will sometimes avoid me when I see her in the library or at the store, no doubt sure that I’ll be asking about her progress with the pen, a subject she’d evidently rather not go into. At least not yet. In short, I've had a life filled with intellectual adventures and emotional gratification of the sort I had no right to expect. Best of all, I have the sense that those adventures are only going to get better in coming years. Mostly, I feel so deeply blessed to have been given the chance to do something that I know millions of my fellow humans would give almost anything for: the chance to earn a living exclusively from my writing. This, then, is a book about what I’ve learned from several hundred people. Some, like Jeanne, were students or those whom I prodded and encouraged. Others were subjects of my writing, real, complicated three-dimensional people who felt pain and suffered stings from ill-chosen words (which taught me to be extra careful in my choice of words). Still others were mentors, those priceless Sherpa guides on the path of life who tend to appear when we need them most. This is, in the end, a book about good habits--the habits of both mind and practice that will stand you in good stead as a writer. Because I didn’t major in journalism or even English in college, I used to imagine I was largely self-taught. But I soon came to realize otherwise. Luck and happenstance have managed to put so many people in my path who taught me how to do it better, how to dig deeper, last longer and work harder. By the towering example of their life and their work, they taught me to defer gratification, stick to what I wanted and needed to say regardless of publishing trends or the whims of editors. They allowed me to soak in their deep sense of craftsmanship and reverence for the truth, a combination I've since come to think of as more combustible than pure oxygen. I owe these friends, mentors and great word craftsmen everything. They’ve opened up an entire life to me and gave me the courage to pursue my life’s work, even when that wasn’t very practical. It’s to all of them that I dedicate this book. As I hope I’ve told every class I’ve ever taught, and any writer I’ve ever coached, neither I nor anyone else can really teach anyone to write. All anyone can hope to accomplish is to lead you to some good habits that, if practiced over time, will help you become better yourself. This is a book about one writer’s take on the habits that will make it more likely that you will continue to do this work, and perhaps one day even do it well. I’m hoping the same for myself. But here’s the bad news (you knew that was coming eventually): nothing comes quickly with writing, as it doesn’t with anything really worth doing. A couple of years ago, when it dawned on me that I had just passed the 20-year mark as a professional writer, the idea began to settle on me that I had just then come out of my apprentice phase, and that I was now perhaps embarking on the intermediate stage of my craft. I was just beginning to get comfortable with the tools, just getting to where I had internalized the habits and the ways of thinking that yield some success, some at least modest mastery over an ever-elusive craft. After 20 years, I had begun to acquire a critical mass of muscle memory for writing and telling stories, for using language to move minds and hearts. And now I could really begin to have some fun, really begin to take this baby out on the racetrack and see what it might do when I opened it up a bit. Here’s hoping you’ll experience that same feeling, as well. Perhaps you already have. 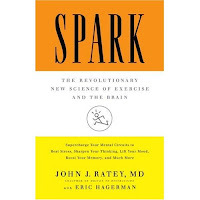 --from an introduction to Spark--The Revolutionary New Science of Exercise and the Brain, by Harvard Medical School psychiatrist professor John Ratey.